Working in batches if necessary, add the cooked beans and at least 1 1/2 cups of their cooking liquid (or add water if need be) to the jar of a blender, as well as the avocado leaves and chiles. Puree until a little chunky. In a large skillet or casserole set over medium-high heat, heat the lard or vegetable oil. Once hot, but not smoking, add the chopped onion. Cook until translucent and edges are beginning to brown, about 6 to 7 minutes. Incorporate pureed beans and reduce heat to medium. Cook, stirring occasionally, until they thicken to your liking. I cook them for about 10 to 12 minutes. I’m sorry yours took longer to cook, Shannon, but I’m glad they were delicious. If your beans aren’t fresh they take longer to cook. If they’re older than a year, they never soften, no matter how long you cook them. Also never add salt until the end. This also can cause them to be too firm. Hello! The half onion that cooks with beans, do you include that half onion in the blender with the beans? Or discard? Thank you! Oh you discard that, Brook. Thanks for asking! I cannot find dried avocado leaves in my little Midwestern town. What can I use as an alternative? I love your show btw. I use many of your recipes and love experimenting with the spices. Hmm try looking online…or you can skip them in the recipe. Bay leaves are a close relative. Will that work, Pati? If you can’t find avocado leaves, you can use epazote or yerba buena (true mint), or you can just skip it, Patty. I have a Haas avacado tree. Can I dry leaves and use them? I recommend buying already dried leaves…you can find them online or at your local Latin market or international market. No, some avocado leaves are toxic. Some have no flavor. Be safe and use the spice type! Love your show and thank you for your generosity of giving out your recipes, some chefs on PBS wouldn’t do it. There is one problem I have for making this dish; I couldn’t find the avocado leaves. Is there any other herbs I can use? Thank you for tuning in Eve! If you can’t find avocado leaves, you can use epazote or yerba buena (true mint) or you can just skip it. Qué papel juegan las hojas de aguacate en la receta? Creo que sera un poco dificil conseguirlas aqui donde vivo. Tienen algun reemplazo? Mil bendiciones. Pati, what does the avocado leaves do to the beans? I’ve never seen them at the stores. Where can I get them? The avocado leaves are used like an herb to give the beans flavor. You can usually find them at your local Latin market or international food aisle…or online. No, it does depend on the type of avocado tree you have, and since you aren’t sure…I recommend you get the leaves from a store :). Oaxaca black beans are one of my favorites. I will have to refry them as you do here. 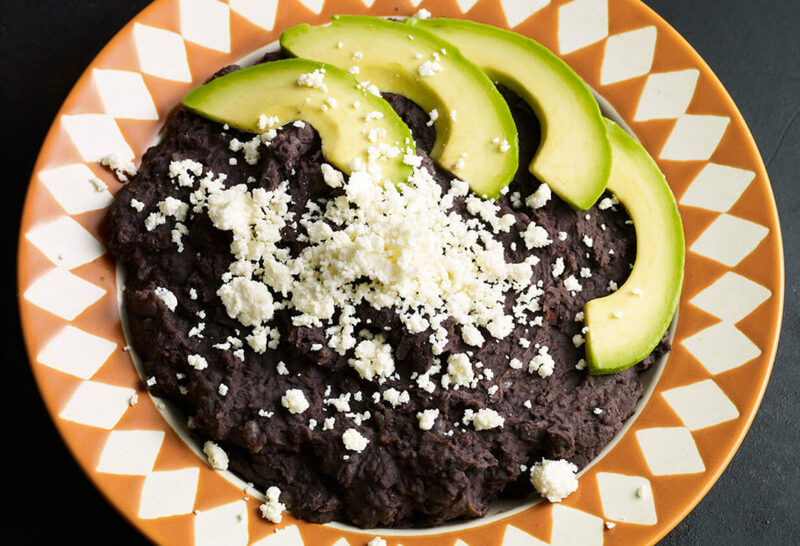 Any chance you will be sharing a recipe for tlayudas that we can make with our black beans? They were one of the many foods I fell in love with in Oaxaca. I was thrilled to watch your show and see you visit Jacobo’s studio. We spent an amazing day there with him and his family about 15 years ago. Our daughter was 5 years old and had a blast playing with the children there. Who needs a common language? All you need is a wagon and a puppy! I loved watching him demonstrate how he mixes his paints and we have many pieces we bought there that are very dear to us. I just put up the painted wooden crèche that we bought there and my husband is very proud of the mask he has that Jacobo made to wear in the previous year’s Dia de los Muertos celebrations. Thank you so much for sharing and reminding us of such a wonderful time. Oh in these beans the smokey flavor comes from toasting the avocado leaves and chiles on a comal. Oh this came out beautifully, so delicious. I’ve been searching forever for one and they all turned out horrible. I am so excited to continue using this recipe. Yay! I’m so glad you loved the beans. I just made this recipe. Oh, my God! They are delicious!!!! Thank you very much for sharing my Mexico recipes!! !